The Tonbridge Historical Society's Pictorial Record Collection contains many fine old photographs, many of which can be seen in the Pictures section of this website. The earliest dateable images are views of Tonbridge School that show the Old Chapel, built in 1859, together with the old school buildings near to the road that were demolished in 1864. These are the work of George Avery who is listed as a photographer in the 1867 local trade directory at The Terrace in the upper High Street. 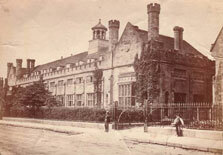 Although the photographs of Tonbridge School were taken outside, much of Avery's work would have been in his studio. The 1881 census records George Avery living in Hadlow and employing one photographer. The photographer employed by Avery was probably Frederick Cooke as he is listed in the census living with his family at George Avery's address in the High Street. Cooke' s work includes many interesting views of the local area, especially buildings within the town. We are fortunate that he also recorded many of the large houses in this part of Kent and published them on cartes de visite. 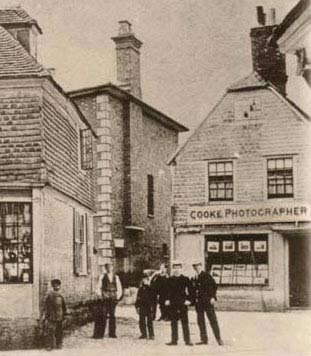 In the photograph shown here (right) Cooke' s name appears above a shop in Bank Street near the junction with the High Street. This is said to have been taken in the 1870s although it cannot be properly dated. Thomas Ashby Flemons (1856-1941) is first recorded as a tobacconist in the High Street just south of the Great Bridge. Later, in 1882, he took over from George Avery at 141 High Street, and remained there until 1911. From the early 1880s there is an increasing amount of information on the reverse of his photographic mounts relating to the services he offered. Prints and enlargements could be made from glass plate negatives and hand coloured images were also available. 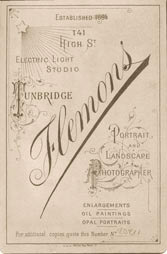 On his photograph mounts Flemons states that his business was established in 1864 and he mentions having the Electric Light in his Studio. Although Flemons was a prolific producer of portraits and landscapes, including views of popular Tonbridge locations such as the Castle and the High Street, he became increasingly well known as a publisher of postcards illustrating current events. Anything happening in the town and Thomas Flemons was there to record it. Events such as the 'Guards dash to Hastings' in 1911 (an exercise to see how quickly troops could be moved from London to the coast), shown here, provided drama for his camera as did the many parades and displays by local people. This enthusiasm for publishing postcards was carried forward by his son Bert C. Flemons (1881-1966) who worked at No. 191 High Street. Bert was also responsible for reproducing many of the very early images, such as the High Street before widening, views of the 'Black Doll' lodging house in Barden Road and the Tollgate in the Hadlow Road, shown here. 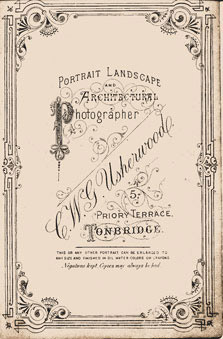 The name Allwork in subtly different forms has long been associated with photography in Tonbridge. The Allwork Brothers began working in Quarry Hill Road in about 1907. By 1911 they had moved into the High Street and taken over the shop and studio of Thomas Flemons, at No. 171, which had been known as 141 High Street prior to renumbering in 1900 and before that was also called 10 The Terrace. Allwork Brothers expanded the business when they acquired the Alma Studio from George Pickett's son, Edwin, in about 1919. Their shop sold items such as pens and drawing equipment, postcards and stationary. John Langridge Allwork put his name above the shop front in 1922 and continued working there until the 1950s. So with Avery, Cooke, Flemons and Allwork these premises have been used by photographers for well over 100 years. Although the shop closed recently, the studio behind it continues in use today. On the west side of the High Street to the south of the Big Bridge was another studio where a photographer called George Garrett was working in the 1870s. We do not have any examples of his work in the Tonbridge Historical Society collection but George Pickett who took over the business in about 1882 is noted for his portraits. Pickett was born in Sussex in 1826; he was a carver and guilder by trade who specialized in making picture frames. His studio at No. 80 High Street became known as the Alma Studio from 1892. Charles W. G. Usherwood was born in Walton on the Hill in Surrey in 1856, the son of the artist and photographer, William Usherwood. The family were living in Dorking in 1881 but soon after that Charles Usherwood moved into Priory Terrace, Quarry Hill Road, near Tonbridge Station. We only have examples of his portraits in our collection but he also advertised architectural and landscape photographs. John F. Mockford began his career as a hairdresser at a shop adjacent to the Alma Studio at 80 High Street. His clients would have included gents from all walks of life who may have given him the introduction to many of the great Kent cricketers of the day whose photographs he published as postcards. 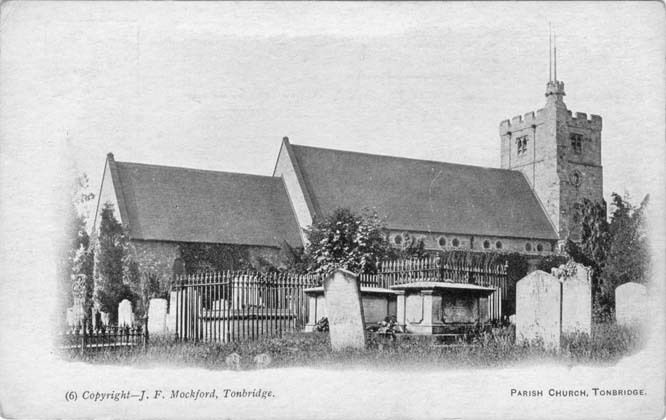 You can see a Mockford card of the parish church here. Although Frederick T. Bridger was a stationer and bookseller, his role in this history is significant because as a printer he was involved in the reproduction and distribution of early photographs. The business at No. 163 High Street is listed in 1856 and remained with the Bridger family until 1967. These are by no means the only photographers working in Tonbridge in the early days. Other names found embossed on to the stiff card mounts record W. G. Lawrence, A. Cornell, William Seymour, Crompton and Fitch and W. A. Carpenter, but very little is known about these people.